Yahoo! Voices, previously called Yahoo! Contributor Network or Associated Content, is one of my favorite sites to write for. You can write about what you want to write about, or you can write articles about any topics that Yahoo! Voices has requested. In addition, there are a few different ways you can get paid. In this blog post I’ll provide a little more information about Yahoo! Voices. 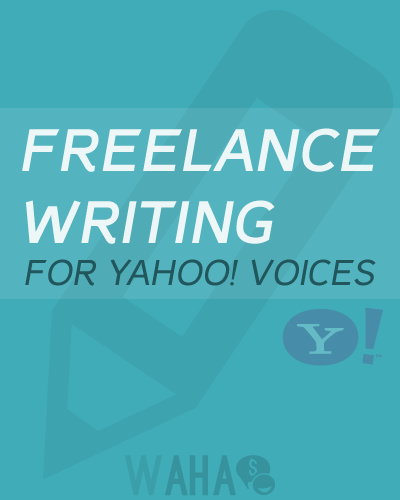 What can I write about on Yahoo! Voices? You can write just about any type of article on Yahoo! Voices – I’ve written articles about working from home, as well as articles on health topics, and a few articles about my town’s sign ordinance, which was challenged after a resident spray-painted a message on his home letting everyone know how he felt about a road-widening project that left him with flooding problems in his yard. What are my options for getting paid? There are a few different ways you can get paid when you write for Yahoo! Voices. After you write your article, you can choose to get paid a fixed amount plus performance payments, get paid performance payments only, or you can choose the display only option. With the fixed amount plus performance payments option, Yahoo will review your article (could take as much as two weeks) and offer you a certain amount. If you accept the offer, you’ll be paid via Paypal in a few days and your article will be published. Performance payments are deposited into your Paypal account every six months. With this option, you give up the right to delete your content from the site at any time. In addition, your article is eligible for distribution by Yahoo’s approved partners. With the Performance Payments only option, you’re only paid performance payments every six months, based on how much traffic your articles receive. With this option, you article is still eligible for distribution by Yahoo’s approved partners, and you also don’t have the option to delete your content. The last option that’s available is display only – with this option, your article is only eligible for performance payments, it is not eligible for distribution with Yahoo’s approved partners, but you do have the option to delete your content if you choose to – this could work well for articles about sites that end up going out of business. How do I increase traffic to my articles so I can get paid more for performance payments? There are a few things you can do to increase traffic to your articles. One thing you can do is share your articles with people once they’re published. You can do this by posting on social networking sites like Facebook, Twitter, and any other social networking sites you’re active on. Another thing you can do is follow other writers on Yahoo! Voices that write about topics you’re interested in – you’ll receive emails when they publish new articles, and you can comment on their articles. Additionally, you can create backlinks to your articles on other sites you write on. For example, if you write a blog post about a subject you also wrote in an article on Yahoo! Voices, you can create a backlink to that article. How can I learn more about how to publish articles on Yahoo! Voices? Yahoo! Voices has an academy with several online courses you can go through – these courses are free to take and will help you learn how to write better content. At the end of each course, there is a quiz you have to take to move on to the next course – you must pass each quiz with at least an 80% score. You can also sign up to be a Yahoo Contributor. I hope this post has provided some useful information about writing on Yahoo! Voices. It is a great site, and I encourage anyone who enjoys writing to check it out. I wanted to thank you for publishing this article about the Yahoo Voices. I am working my way through the academy now! I like that they have added this as it helps prospective writers for them know exactly what their looking for and teaches exactly how to stand out in the crowd. Most other open ended publishing platforms like this have next to no how-to information and you have to find it yourself through other writers or the web. I agree. Their information is very helpful and can benefit writers across all platforms when using the basic principles.